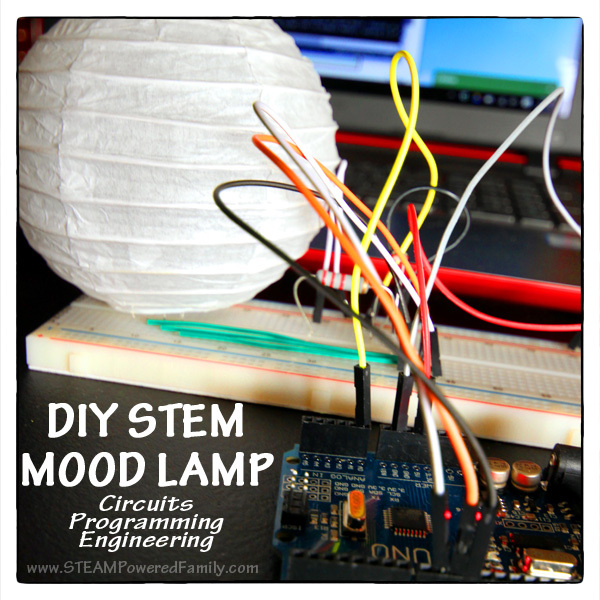 DIY Mood Lamp, does this sound like something way beyond your current skills? Well, guess what? 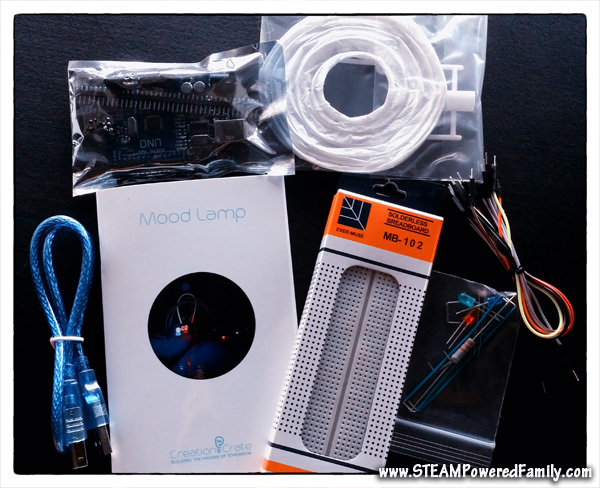 I’ve discovered an amazing new program, for older kids to adults, that will teach you electronics, circuits, programming, technology and engineering. The first STEM project? 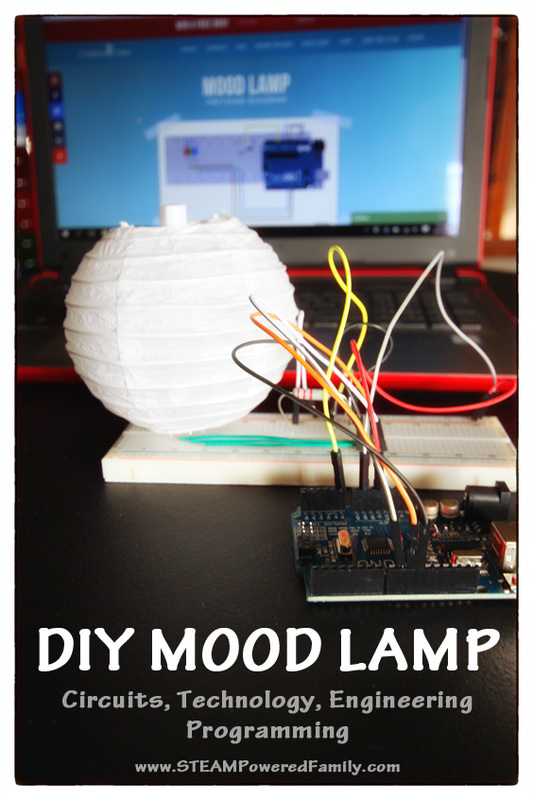 Create your own DIY Mood Lamp. Brilliant! Disclaimer: I was given a free box in exchange for an honest review. All thoughts are my own. When I first heard about Creation Crate I was so excited. 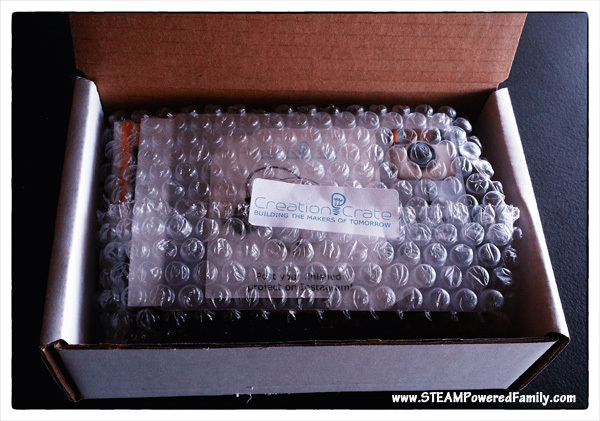 We love monthly subscription box services, I mean who doesn’t love getting packages in the mail? But this one was different from anything we have ever tried before. This one offered up a great challenge for my son and I (and my husband too! ), to learn about electronics and programming. It was not only educational, but had long term educational possibilities as each box contains a challenge that builds on the knowledge learned from previous boxes. We love learning programming and coding, we also love building robots and working with hardware and circuits. We’ve tried lots of different programs, but Creation Crate brings something new and exciting to our STEM education. 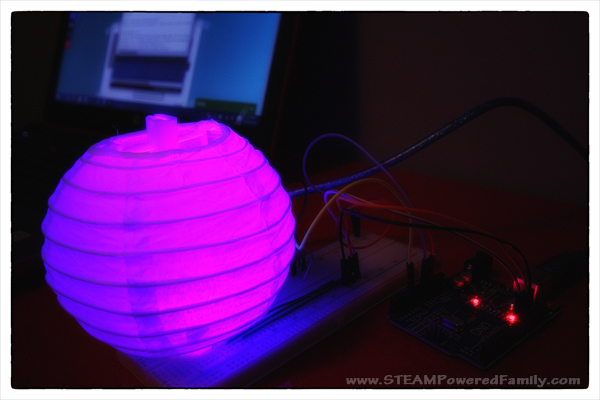 The first project is to build and program a DIY Mood Lamp that turns on in the dark and changes colours based on a programmed sequence. 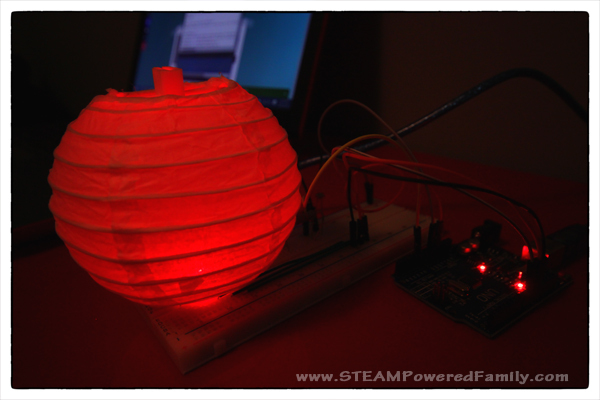 The instructions for our DIY Mood Lamp were quite easy to follow as we assembled the hardware. It requires attention to detail and lots of squinting at the diagrams to ensure we were plugging all the wires and sensors into the appropriate slots. My only issue was that my wires were not the same colours as the diagram. This gave me some minor palpitations until I realized the colour didn’t matter. Next we moved onto the programming portion. 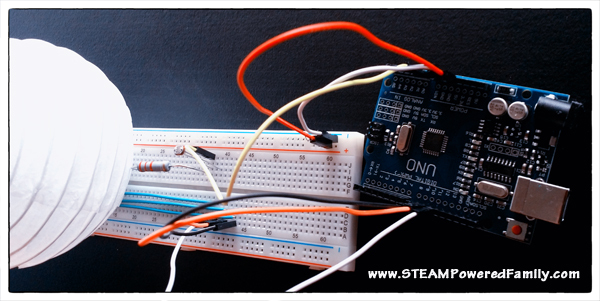 For this we worked in a free software program from Arduino. The Creation Crate manual takes you through each step, explaining each one carefully, telling you what it is doing, and exactly what to type. My son and I took turns reading while the other typed. Then we uploaded our programming to the Uno board with no errors the first time, success! We excitedly packed everything up and went into a dark bedroom, turned off the lights and … nothing happened! I checked our programming, checked our hardware, still nothing. My husband came home, I asked him to look. He got it to turn on (in a well lit room) but one LED wouldn’t turn on and it wasn’t turning off in the light or on in the dark. After trying a few more things I contacted Creation Crate. They asked me to send my code and, d’oh! we had missed a section of code! I think during one of our switches between who was typing caused us to miss a couple of lines. 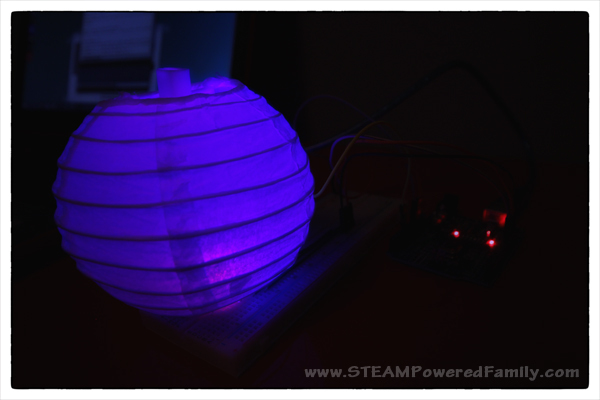 It was a fantastic lesson in proofreading your programming (I was so focused on the hardware, I assumed the issue was there) and now our DIY MOOD LAMP WORKED! 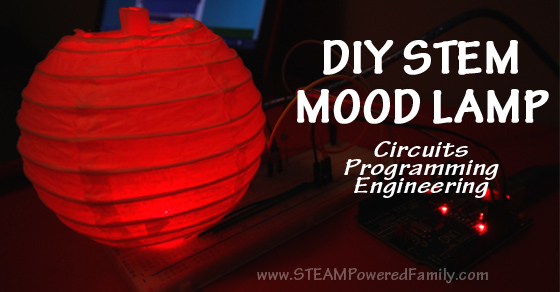 We had so much fun playing with our DIY Mood Lamp. The manual includes different challenges and lessons for how you can alter your code to change how the lamp functions. This is a fantastic way to gain a deeper understanding of what the programming is controlling and how to make your piece unique and your own. I loved the way it would cycle through all the colours! So beautiful! If you have a tech interested older child, teenager or adult in your life, this subscription box would be a fantastic gift. For the homeschooler, this is an excellent addition to your curriculum. Each box builds on the knowledge from the box before. So, with each box you are learning more and the projects are building in difficulty. As such, everyone gets the same first box. It’s not like traditional subscription box services in that way. Which makes it even more effective as an effective learning tool, everyone starts at the beginning. And I LOVE their approach to learning and education! You can read about it here. May I ask how you were able to contact them successfully? I am having issues uploading the program for this project, and have tried emailing (info@mycreationcrate.com), as well as tried messaging them on their facebook page, but haven’t heard back yet. Did it take long for you to hear from them? I tried to contact them on Monday, so it’s been 5 days for me, but maybe I just need to wait a bit longer! Thanks for your help! We’re excited to see ours start working too! Actually if you look in your workbook there is a URL with a password that brings you into a step by step tutorial that might help answer your question. Normally they are great at responding but at this time of year it can be really busy. If you don’t hear from them by Monday and the tutorial doesn’t help, I would send them another email. Best of luck!